The Artichoke or Globe Artichoke (Cynara scolymus) is a perennial plant of the Asteraceae family. They first came from Southern Europe around the Mediterranean. The thick scales and bottom parts of the young flower heads can be eaten. They are a culinary delicacy. The bottom part of the young flower head is called a heart. This vegetable grows to 1.4–2 m (4.6–6.6 ft) tall, with arching, deeply lobed, silvery, glaucous-green leaves 50–82 cm (20–32 in) long. The flowers develop in a large head from an edible bud about 8–15 cm (3–6 in) diameter with numerous triangular scales; the individual florets are purple. The edible portions of the buds consist primarily of the fleshy lower portions of the involucral bracts and the base, known as the "heart"; the mass of immature florets in the center of the bud is called the "choke" or beard. These are inedible in older, larger flowers. In the US, large globe artichokes are frequently prepared by removing all but 5–10 mm (0.2–0.4 in) or so of the stem. To remove thorns, which may interfere with eating, around a quarter of each scale can be cut off. 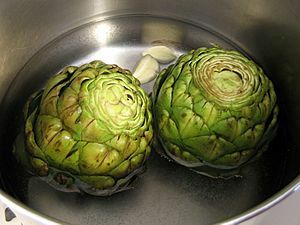 To cook, the artichoke is boiled or steamed. A cooked, unseasoned artichoke has a delicate flavour, reminiscent of fried egg white. The core of the stem tastes similar to the artichoke heart, and is edible. Salt may be added to the water if boiling artichokes. 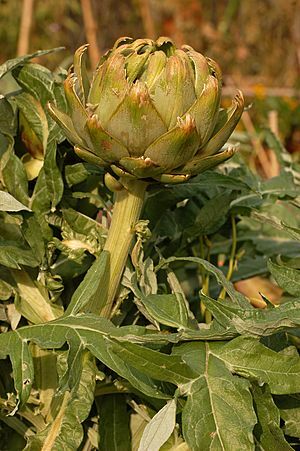 Covered artichokes, in particular those that have been cut, can turn brown due to the enzymatic browning and chlorophyll oxidation. Placing them in water slightly acidified with vinegar or lemon juice can prevent the discoloration. Leaves are often removed one at a time, and the fleshy base eaten, with hollandaise, vinegar, butter, mayonnaise, aioli, lemon juice, or other sauces. The fibrous upper part of each leaf is usually discarded. The heart is eaten when the inedible choke has been peeled away from the base and discarded. The thin leaves covering the choke are also edible. In Italy, artichoke hearts in oil are the usual vegetable for "spring" section of the "Four Seasons" pizza (with olives for summer, mushrooms for autumn, and prosciutto for winter). A recipe well known in Rome is Jewish-style artichokes, which are deep-fried whole. The softer parts of artichokes are also eaten raw, one leaf at the time dipped in vinegar and olive oil, or thinly sliced and dressed with lemon and olive oil. Stuffed artichoke recipes are abundant. A common Italian stuffing uses a mixture of bread crumbs, garlic, oregano, parsley, grated cheese, and prosciutto or sausage. A bit of the mixture is then pushed into the spaces at the base of each leaf and into the center before boiling or steaming. A similar recipe is popular in coastal Croatia. 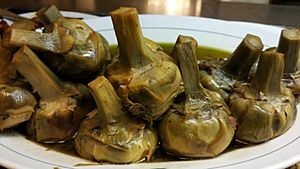 In Spain, the tenderer, younger, and smaller artichokes are used. They can be sprinkled with olive oil and left in hot ashes in a barbecue, sauteed in olive oil with garlic, with rice as a paella, or sautéed and combined with eggs in a tortilla (frittata). Often cited is the Greek aginares a la polita ("artichokes city-style", referring to the city of Constantinople), a hearty, savory stew made with artichoke hearts, potatoes, and carrots, and flavored with onion, lemon, and dill. The island of Tinos, or the villages of Iria and Kantia in the Peloponnese, still very much celebrate their local production, including with a day of the artichoke or an artichoke festival. Another way to use artichokes is to completely break off all of the leaves, leaving the bare heart. The leaves are steamed to soften the fleshy base part of each leaf to be used as the basis for any number of side dishes or appetizing dips, or the fleshy part is left attached to the heart, while the upper parts of the leaves are discarded. The remaining concave-shaped heart is often filled with meat, then fried or baked in a savory sauce. Frozen artichoke hearts are a time-saving substitute, though the consistency and stronger flavor of fresh hearts when available is preferred. Throughout North Africa, the Middle East, Turkey, and Armenia, a favorite filling for stuffed artichoke hearts includes ground lamb. Spices reflect the local cuisine of each country. In Lebanon, for example, the typical filling would include lamb, onion, tomato, pinenuts, raisins, parsley, dill, mint, black pepper, and allspice. A popular Turkish vegetarian variety uses only onion, carrot, green peas, and salt. Artichokes are often prepared with white sauces and other sauces. Artichokes can also be made into a herbal tea. 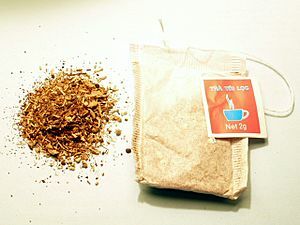 "Artichoke tea" is produced as a commercial product in the Da Lat region of Vietnam. An herbal tea based on artichoke is also produced in Romania and is called Ceai de Anghinare. The flower portion is put into water and consumed as a herbal tea, called alcachofa in Mexico. It has a slightly bitter woody taste. Some varieties of artichoke display purple coloration. Artichoke Facts for Kids. Kiddle Encyclopedia.